The JV team did a fantastic job yesterday bringing home gold, silver and bronze medals in four events. The Women’s Foil team eared a bronzed medal. The Men’s Epee earned a silver medal. The Men’s and Women’s saber squads each brought home gold medals. 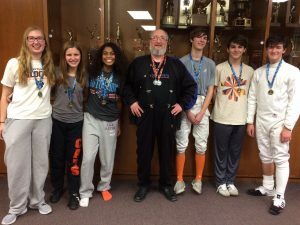 A great day for Libertyville and Vernon Hills fencers. Congratulations!